This is the logo - no picture of the actual head is available yet. New drum products debuted at this year's Summer NAMM were pretty thin on the ground - so please put your hands together for Evans' brand new G-Plus tom heads. G-Plus are constructed from a single-ply 12-mil film and come with either a translucent frosted-style coat or clear finish. They're available in sizes 6" - 20" and will set you back between $24 - $47. Evans is pitching these heads at the versatile drummer - "from jazz to fusion to rock". 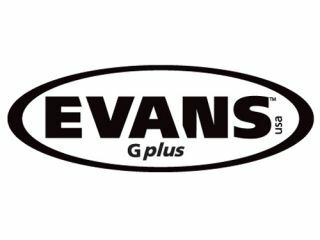 "The new Evans G-Plus single-ply tom heads offer the best of both worlds: ample tone in combination with durability and attack," says Mike Robinson, Evans senior product manager. "Great for players who prefer the sensitivity of a one-ply head, but who don't want to sacrifice strength, the Evans G-Plus heads are extremely versatile for any playing style or situation."